Large dogs can make amazing pets, but some of them have a ton of hair to deal with. If you’d rather spend your time playing with your dog than brushing them, you may be considering a short-haired large dog breed. It is important to note that short-haired dogs do still shed, sometimes more than you would expect (like Labrador Retrievers), but they still require less brushing than dogs with longer fur. Short-haired dogs also tend to be more weather-resistant than dogs with longer hair, and they’re so much easier to clean up after a roll in the mud – or something worse! Let’s talk about the 6 most-popular short-haired dog breeds and 4 large short-haired dog breeds you haven’t considered in your search for the perfect best friend. You shouldn’t just pick a dog off this list willy-nilly and decide they will make the perfect addition to your family – not every large dog is right for every family, and large dog breeds can be prone to expensive or deadly health conditions. That’s why it’s important to do your research on every dog breed to make sure they’re a good match for your family. You also want to research breeders to find one who does plenty of genetic testing on their breeding dogs and constantly aims to produce the healthiest litters. Shedding. Short-haired dogs shed year-round, and while regular brushing can reduce the amount of shedding, nothing will stop it completely. Some short-haired dog breeds shed more than others, so keep that in mind when looking for your perfect match. Drool. Some short-haired dogs drool – A LOT. If drool grosses you out, you’ll want to avoid certain breeds on this list, like the Neapolitan Mastiff. Food costs. 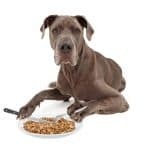 Large dogs eat a lot of food, and cheap food can lead to more health problems (like a human who ears only junk food). 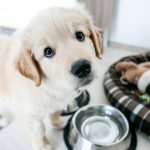 Can you afford to feed a large dog? Vet costs. Big dog breeds can have big vet bills. Large breed dogs are especially prone to hip dysplasia, which can be debilitating, and bloat or gastric torsion, which can be deadly. Can you afford emergency or frequent vet bills to keep your large dog healthy? Energy levels. While some large breeds dogs are giant lap dogs, some have a ton of energy and need LOTS of exercise. Do you have the time and energy to handle a short-haired large dog with high energy needs? Lifespan. The sad reality is that the larger the dog, the shorter the lifespan. Are you prepared to say goodbye after only 6-10 years? If you’re looking for a dog with a longer lifespan, look for some of the smaller dog breeds on our list (but don’t let a short lifespan keep you away from the perfect dog for your family). Now that you have a better idea of what to look for when searching for the best short-haired large dog for your family, let’s talk about 10 dogs you should consider in your search for the perfect family pet. 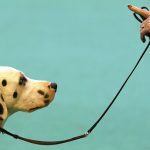 These 6 dog breeds are all in the top 20 as far as popularity according to the AKC. There’s a reason for that – they have great personalities and make a great addition to most families. Let’s explore the 6 most popular short-haired large dog breeds. 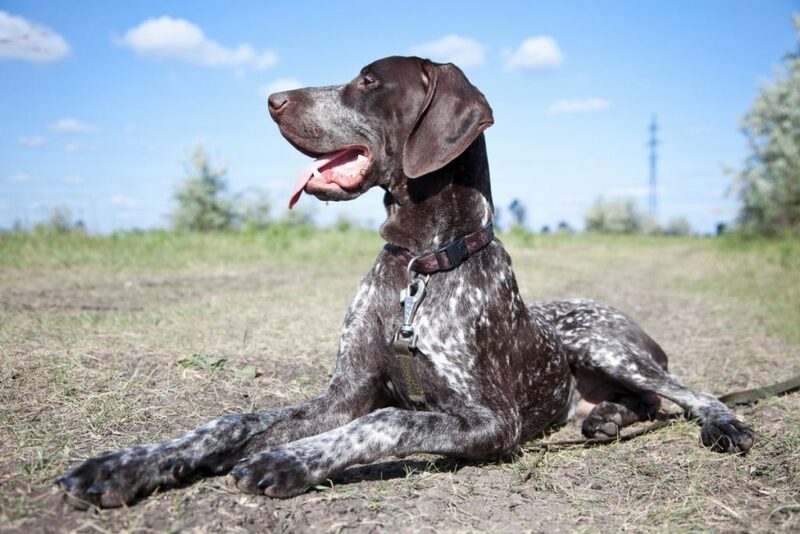 The German Shorthaired Pointer (GSP) is becoming more and more popular every year, and for good reason – these intelligent dogs are easy to train and friendly with humans of all sizes, although their excessive energy levels may overwhelm smaller children. German Shorthaired Pointers were bred to do a variety of tasks related to hunting, including pointing and retrieving game from land or water. This versatility makes them great hunting buddies, but they’re also easy to train for just about any other dog sport that strikes your fancy. Speaking of dog sports, the GSP has TONS of energy and needs plenty of exercise every day. Dog sports are a great way to help burn off some of your German Shorthaired Pointer’s energy. Without enough exercise, they can become bored and destructive. You should plan on giving your GSP at least 1-2 hours of high-intensity exercise every day. The GSP was bred to spend all day hunting with its master and doesn’t like to be left alone very much. If everybody in your household is away from home for 8 hours a day, the GSP probably isn’t the right fit for you. They are prone to separation anxiety and can become exceptional escape artists. The Labrador Retriever has been the most popular dog breed in America for nearly three decades. Their friendly personalities and desire to please make them excellent dogs for most families. One thing many people are surprised about is just how much the Labrador Retriever can shed. They have longer hair than most other short-haired dogs, and it sheds a lot year-round. Plan on spending a lot of time brushing to reduce how much hair is left around your house. Another thing many people don’t realize when they get a Labrador Retriever is how much exercise they need. 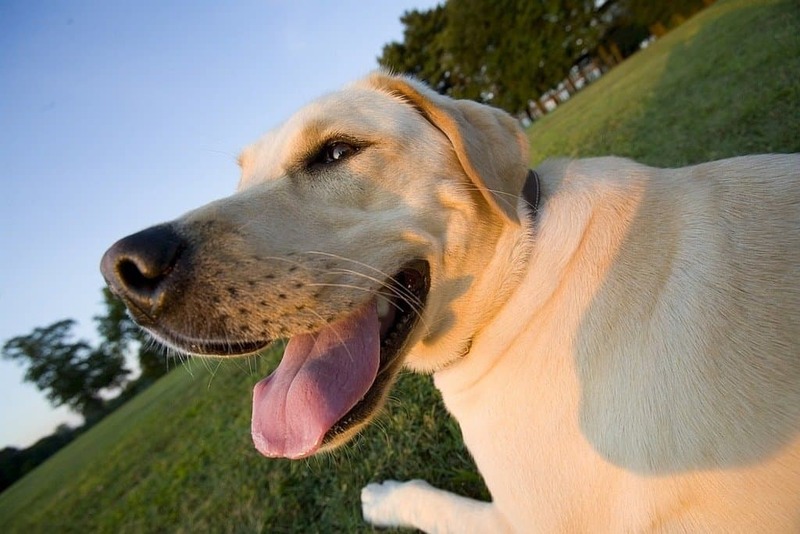 Labs are prone to both hyperactivity and obesity, so plan on spending at least an hour a day on a long walk or plenty of fetch so your dog can use up their excess energy and burn some calories. While Labrador Retrievers are stockier than many other dog breeds, you should still be able to feel their ribs. 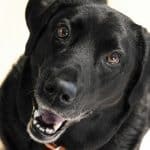 Many people fail to realize how overweight their Lab is because they are naturally somewhat barrel-chested, but Labs can suffer a variety of health problems related to obesity which can shorten their lifespan by a year or two. Don’t give in to their pleading eyes and give them endless treats. While Great Danes were originally bred to hunt boar, these days they’re more likely to think of themselves as giant lap dogs. All aggressive tendencies have been bred out of them, leaving them with the personality of a 150-pound toddler. The Great Dane is currently the 16th-most-popular dog in the United States, and it’s easy to see why. They don’t have quite as much energy as some other large breeds, they’re eager to please, and despite being the tallest dog breed, their lean physique means they eat less than you would expect for such a large dog. Great Danes do need some exercise, but they’re generally happy with a long walk and don’t need hours of fetch to be happy. While Great Danes love children, their sheer size means they probably wouldn’t do well in a house with small children since a Great Dane’s tail is exactly the right height for accidentally whacking a toddler in the head. 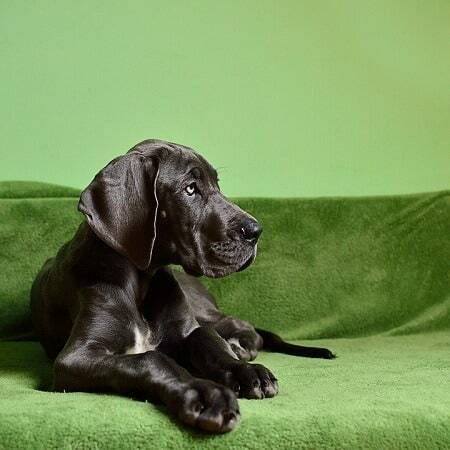 Thanks to their height, puppy-proofing your home is an extra chore when your dog can easily reach everything on your countertops, but Great Danes are eager to please, and early training and socialization can help reduce problems that their size may cause when they reach adulthood. Despite their fearsome reputation, well-trained Rottweilers can be an excellent addition to the family and are the 8th-most-popular dog breed in America. The Rottweiler isn’t for timid owners. They need somebody who is committed to being a firm trainer and handler as well as giving their Rottie puppy proper socialization. With these things, the Rottweiler makes an amazing companion who will only be aggressive if a clear and obvious threat is presented to their family. Without solid training and socialization, Rottweilers can be aggressive toward all strangers and snappy toward an owner they believe is below them in the household’s hierarchy. Rottweilers are prone to both drooling and shedding, so they aren’t the best pet for people who like to keep a clean home. 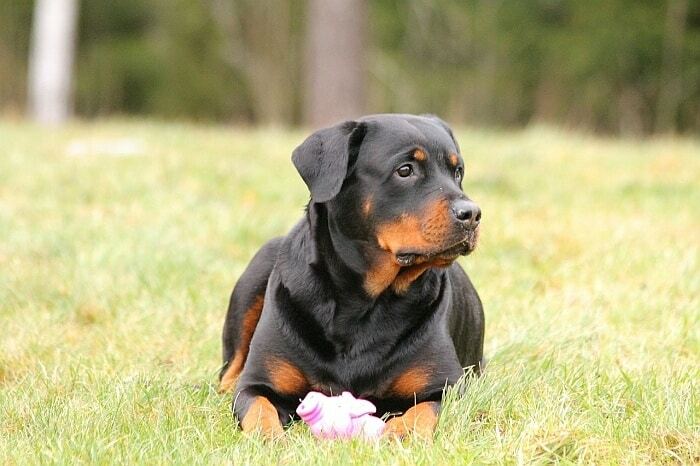 While Rotties usually do well with children, they aren’t the most dog-friendly of breeds. This is a dog who will do better with their own backyard rather than trying to play around a bunch of strange dogs at the dog park. Thanks to their stocky build, Rottweilers are especially prone to obesity because their owners don’t realize how much of their dog’s build is due to fat rather than muscle. You should be able to feel your Rottweiler’s ribs – if you can’t, it’s time for your dog to go on a diet. Known as the clowns of the dog world, the Boxer has a playful personality and the longest puppyhood of just about any other dog breed – they aren’t considered fully mature until they’re 3 years old. Even then, most Boxers retain their puppy-like enthusiasm for life well into their senior years. Boxers, the 11th-most-popular dog breed in the United States, absolutely love children, but their bouncy personality can lead to a paw to the head of a toddler, so keep that in mind when deciding if a Boxer is right for your family. Thanks to their shortened nose, Boxers don’t do well in the heat – they are prone to heat stroke. Their short coat isn’t great for cold weather, either, and some owners like to joke that their Boxer’s range of tolerance is between 72 and 74° Fahrenheit (21-22° Celsius). This is crucial to keep in mind because the Boxer needs A TON of exercise to keep them happy and prevent them from becoming destructive. 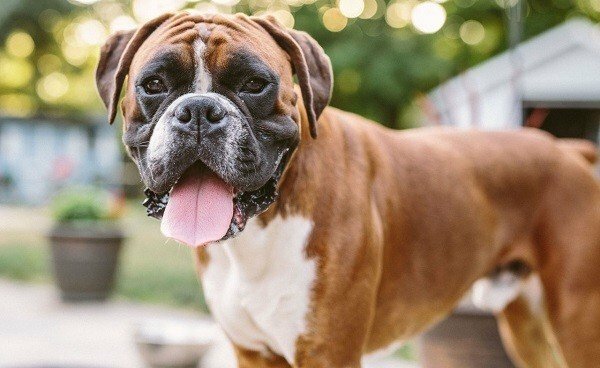 If you live in an area with extremely hot summers, you need to plan on long runs or trips to the dog park in the early morning and late evening hours to prevent you Boxer from overheating. It may surprise you to learn that the Doberman Pinscher is the 17th-most-common dog breed in America. 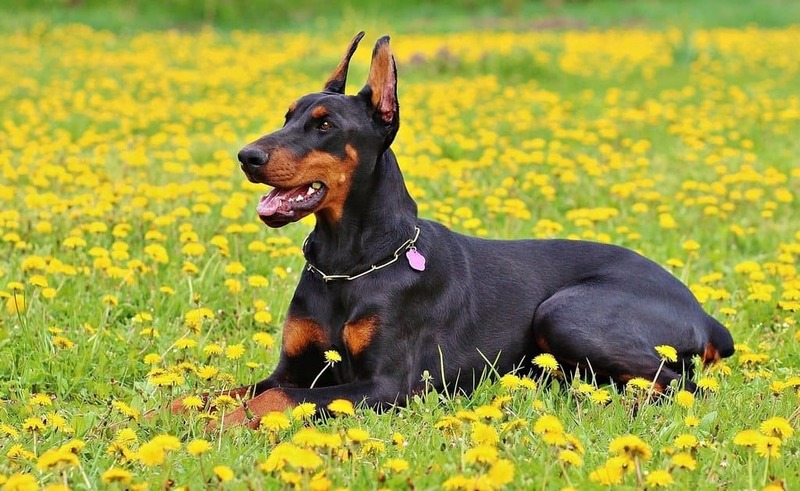 With a reputation as a fearsome guard dog, you may be shocked to hear that the Doberman Pinscher can actually make a great family pet with an owner who takes the time to train and socialize them. The Doberman Pinscher was developed in Germany toward the end of the 19th century to be a guard dog. You will still see these dogs as guard dogs or working for the military or police, but they are becoming increasingly popular as family pets. 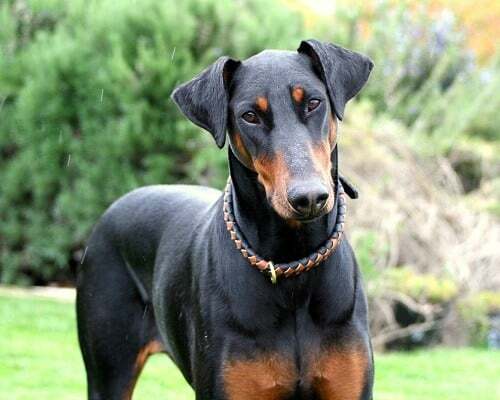 Dobermans will try to take the lead as the alpha leader of the home, so they need a strong owner who is confident training strong-willed dogs. The Doberman is extremely intelligent, but they can put that intelligence to bad use if they believe they’re the leaders of the household. Dobies need a lot of exercise and need to be by their people as much as possible. This isn’t a dog breed who can just be locked up at home all day long – they are likely to become destructive. With enough exercise, training, and socialization, the Dobie can make a friendly family member who will protect their family from threats without being aggressive toward any stranger they come across. Are you more interested in having a dog breed that you won’t see five others of in your local dog park? These 4 short-haired large dog breeds are less common, and you may get a lot of people asking, “What breed of dog is that?” They still make amazing family pets, though, and shouldn’t be overlooked in your search for the best short-haired large dog breed for your family. Here are 4 short-haired large dog breeds you haven’t considered. This ancient dog breed was developed more than 5000 years ago and might have hunted gazelle with pharaohs, leading to their name. While the Pharaoh Hound is the national dog of Malta (an island in the Mediterranean), they aren’t very common in the United States yet. Pharaoh Hounds are great with people and other dogs, but they do have a tendency to chase small animals, so they need to be on a leash anytime they’re outside of a home or fenced yard, and they might not become friends with cats unless introduced at a very young age. 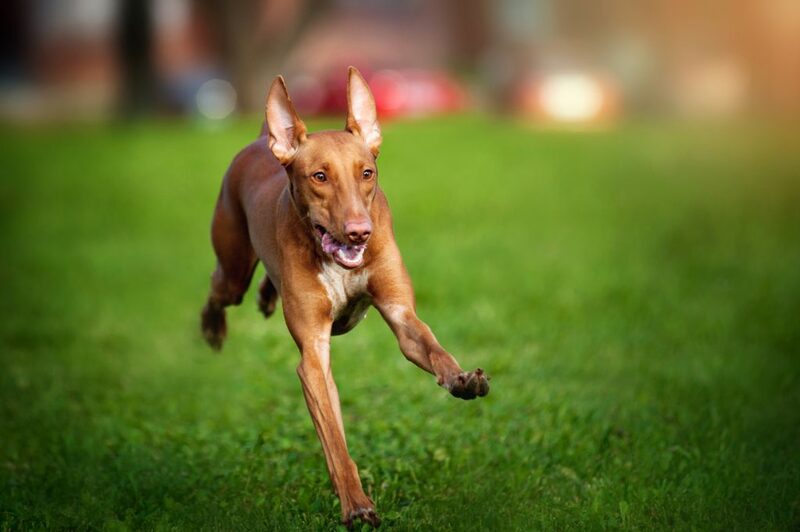 The Pharaoh Hound is a dog breed that loves to smile so much that many owners teach their dog to smile on command. Their nose and ears will also blush when they get excited. Thanks to their tropical origins, Pharaoh Hounds don’t do well in cold weather, but they don’t mind the heat, which is good because they need plenty of exercise. Pharaoh Hounds shed very little, but they can bark a lot, so consider this tradeoff when deciding if the Pharaoh Hound is best for your family. While the Bluetick Coonhound can make a good family dog, they’re happiest when they’re on the trail of something. Not interested in taking your dog hunting? 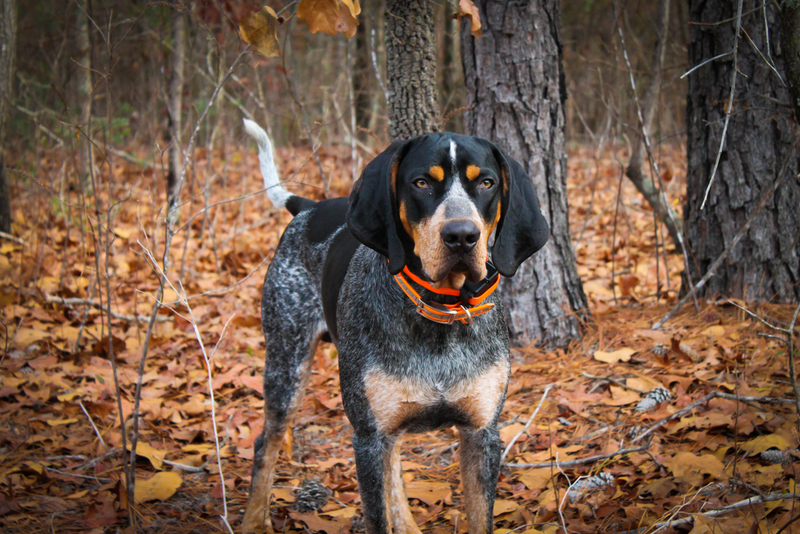 A Bluetick Coonhound would make an excellent search and rescue dog because they can follow trails that were left days before. Bred to work all day, the Bluetick Coonhound requires plenty of exercise, but they love people, including children, and will happily laze around the house in between long walks. The Bluetick Coonhound gets its name from its coloration, which is dark blue with black spots. Interestingly, the Bluetick Coonhound is one of the oldest dog breeds that originated in the United States. According to the AKC, the Bluetick Coonhound is descended from French staghounds given to George Washington as a gift from his friend, the Marquis de Lafayette. These staghounds were bred with English Foxhounds and a few other hounds to create the breed we know today. Traditionally used to hunt raccoons, Bluetick Coonhounds were also used in packs to hunt things like boar, bear, cougar, and lynx. It’s important to note that, like most scenthounds, the Bluetick Coonhound loves to bark and bray, so they may not be ideal if you’re bothered by loud dogs. If you’re looking for a super friendly and highly energetic dog, but you aren’t wild about the Labrador Retriever, the Pointer may be just the dog for you. If you’re looking for a jogging or hiking partner, look no further than the Pointer. Bred to hunt all day, they need plenty of exercise and love nothing more than spending time being active with their owner. They’re also an ideal breed for dog sports thanks to their intelligence and enthusiasm. 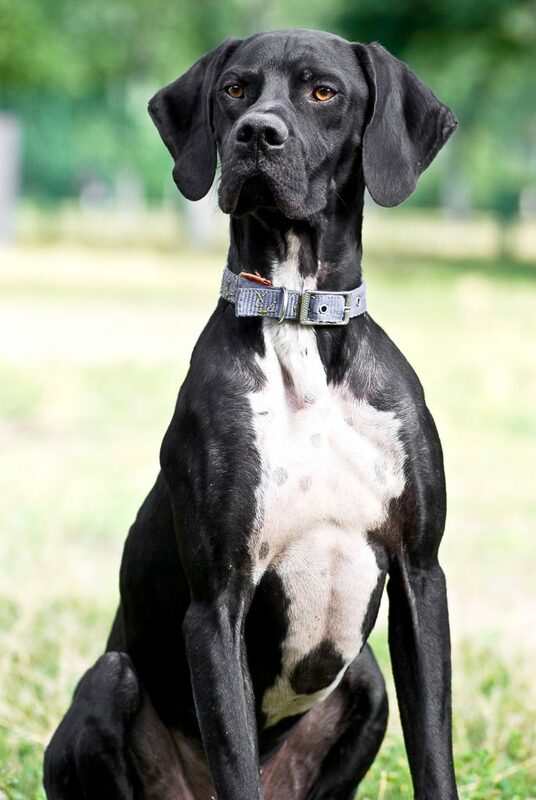 Unlike the happy-go-lucky, eager to please Lab, the Pointer needs a firm owner who will put time into training them and understanding their stubborn nature. They are easily bored, especially when paired with a lack of exercise, and they can become destructive if left home alone too much. While the Pointer gets along with children and most family pets, they may have a complicated relationship with pet birds since they were bred to point to and retrieve birds that had been shot by hunters. If you have a bird and want to avoid a Sylvester and Tweety situation, then the Pointer may not be the breed for you. Looking for a really big dog that will cause people to stop, stare, and ask what type of dog you have? 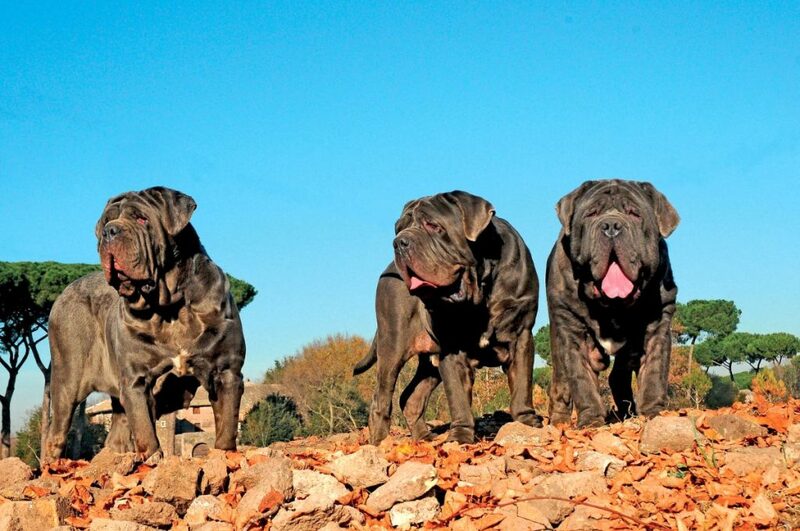 Look no further than the Neapolitan Mastiff. While the Neo’s looks and bark can be intimidating, the breed is generally friendly and makes a great family dog (as long as you don’t mind drool). The Neapolitan Mastiff needs one or two good walks per day, but they are otherwise calm and gentle, making them a great choice for families with children that are large enough not to be knocked over by an accidental swipe of their tail. Generally content to be a 200-pound lap dog, it’s crucial that you watch how much food and how many treats you give your Neapolitan Mastiff. They are prone to obesity and can suffer many of the same weight-related problems that humans do along with hip dysplasia and arthritis. 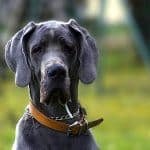 The Neo can be stubborn, so a confident owner who is willing to put in the time to train their Neapolitan Mastiff is crucial to prevent your household from being run by a dog that may weigh more than you do. Wrapping Up: Which Short Hair Dog is Right for You? As you can see, each short-haired large dog breed has a unique personality, exercise needs, and a tendency to drool. A big dog is a big responsibility, so you should factor in every bit of each dog’s personality before deciding which short-haired large dog breed is the best fit for your family.